Pat Smith in YAMMA Pitfighting! 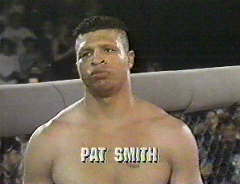 Pat Smith is one of my all-time favourite MMA fighters. Ever since I saw him pummel the brains out of that ninja’s nose in UFC 2, he’s held some kind of martial magic over me, like a demonic Mickey Mouse. The guy is a complete badass, in the old-school sense of the word. Don Frye (best video ever here) has pulled out of his bout with Oleg Taktarov in the bizarrely named and doomed to fail YAMMA Pit Fighting promotion. Frye stated something to do with severe moustache-related injury, my sauces (mostly ketchup) tell me. But Smith is stepping in! This is great news! I’m much more excited about this fight. Don’t ask me why because if I think about it too hard I probably won’t be that excited for it.